Note: A minimum quantity of 95 must be ordered, and in units of 5 thereafter. Rediform Employee Time Card, Daily, Two-Sided, 4-1/4 x 7, 100/Pad - Time card pad offers a daily, durable, convenient record of employee hours and keeps 100 time clock cards neatly together until needed. Each card is two-sided and unnumbered. The front offers designated blocks to fill in the employee's name, date, job names or numbers, kind of work, hours, rate, amount, total regular time and total overtime as well as in and out times. At the bottom, boxes are labeled, Entered Payroll," "Entered Repair Order," "Time and Job Nos. Correct," and "Foreman." The back of the card details the work done, start times, stop times and elapsed times. 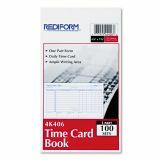 Time card pad also features a flexible cover and 100 cards made of manila stock."